The galaxy is at war. The Pyrious Empire is struggling to maintain power, and a few young alien races see this as a long-awaited opportunity to become the next galactic superpower. Shipyards in every world are ramping up starship production, and arguments and accusations at the galactic council grow more and more heated. The tension across lightyears is palpable. Even now, secret alliances are underway and the sentient races are quickly taking sides. In Empires of the Void, two to four players compete to expand their empire in a vast, diverse galaxy. Each time a player reaches a new planet, he must decide whether to conquer it and strip the land of its resources, or befriend the natives and obtain their special ability. Players earn victory points by expanding their empires, through technological growth, and by controlling the galactic council. The player with the most victory points after three scoring rounds wins the game and becomes the next ruler of the galaxy! 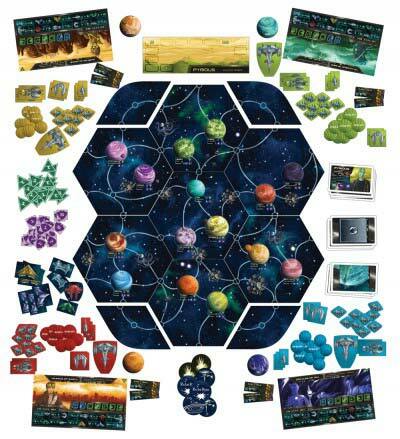 For years, people have looked to the game Twilight Imperium as the standard in 4x or Space/Sci-Fi/Galaxy Ruling games. It is a massive game that allows you to fine-tune all the minute details of your empire. However, the price you pay for such a massive and detailed game is that it takes the better part of a day to complete one game. So, naturally, people have begun searching for games that give them a similar feel, but in far less time. Designers have answered the call offering several such games in the last few years. Empires of the Void by Ryan Laukat is one such game. In Empires of the Void, each player takes control of a different alien race, each with their own unique special ability and backstory. Starting from their home planet, they aim to take control of neighboring planets through either force or diplomacy. Taking a planet by force is easier, and gives you some benefits (increased income and resources) but if you try diplomacy, albeit more difficult, you can also gain the special ability of that planet (this can be anything from the ability to build a different kind of ship to making diplomacy an easier option). As the game progresses, players will be increasing their powers and income by controlling more planets, as well as discovering new technologies. As the size of their empires and their fleets increase, they are bound to run into each other. Combat is handled through a simple dice-rolling mechanic where certain ships fire faster than others and each ship has a certain number they need to roll in order to score a hit. The winner is the player who scores the most victory points. Victory points are awarded at 3 scoring rounds. Players are awarded points for certain technologies, for controlling planets, and for having a majority of influence in the Galactic Council (which comes from befriending planets rather than conquering them). So does Empires of the Void succeed in being Twilight Imperium Lite? I guess the answer to that question depends on what you are looking to get out of a 4x game. It doesn’t offer much in the way of exploration as all of the planets are revealed at the beginning of the game. There is plenty of expansion as you increase your empire from one planet to several. There is plenty of exploitation as you take control of planets to gain various advantages. There is plenty of extermination as you jostle with the other players for control of key planets. 1. The rulebook is not very well written. It does not address several common situations that come up in games. However, the designer has uploaded an updated rulebook that addresses these issues. 2. There is a lot of dice-rolling, which means that sometimes, no matter how well you plan and prepare, you can lose because of bad luck. This issue is being addressed in a possible expansion that is currently in beta-testing. 3. The tech-tree is not clearly laid out and difficult to keep track of. Each of the technologies comes as a small rectangular cardboard chit. There is no clear map of which technologies are prerequisites for others and it can be difficult to tell which are available for you to build at any given time. I believe this is also being addressed in the expansion. However, don’t let those issues steer you away from what is actually a very solid and well designed game. Though the rulebook is not very well laid out, the rules are actually quite simple and easy for new gamers to pick up. The artwork is gorgeous (it is actually what drew my attention to this game in the first place) and the components are all very sturdy cardboard. One your first few turns, it feels like you can’t accomplish much, but by the end of the game, you can be conquering several planets per turn. This gives you the feel that your empire and your power are, in fact, growing as you progress through the game. The mechanic of choosing between diplomacy and force is something that I think is fairly unique and really gives this game a different feel than any other game I have played. Will an expansion make this game better? More than likely, but it’s a great game as it is and one I highly recommend. 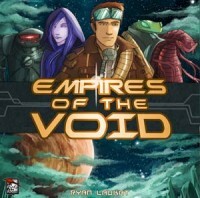 Add a Review for "Empires of the Void"